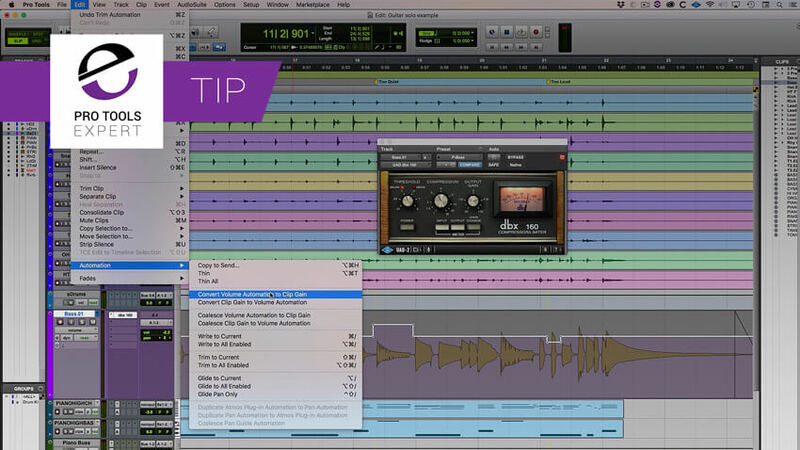 Pro Tools | Convert Pro Tools Volume Automation To Clip Gain - When Does it Sound Different? See How And Why In Our Free Expert Tip. Convert Pro Tools Volume Automation To Clip Gain - When Does it Sound Different? See How And Why In Our Free Expert Tip. In this free video tutorial Pro Tools Expert team member Julian Rodgers demonstrates how to convert volume automation to clip gain information and vice versa and illustrates the difference using clip gain or volume automation can make to the sound. This feature is only available in Pro Tools Ultimate. What Difference Does It Make When You Use Clip Gain Or Volume Automation? Clip Gain happens pre insert, pre send. Very like the gain pot on an analogue mixer. Because of this clip gain will affect gates and compressors on inserts, this is only one of the effects of this difference but it is probably the most significant. Another significant difference is the fact that volume automation is accessible via the faders, especially significant if you are using a control surface.